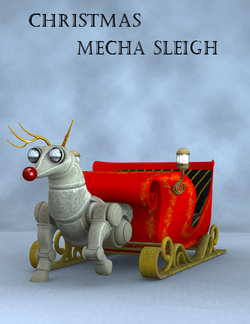 Christmas Mecha Sleigh is a non-human figure by Sixus1. A Steampunk Santa Sleigh, the product contains a reindeer and sleigh combo. Also contained in the product is a walk cycle for the sleigh and a pose set for Victoria 4 and Micheal 4. This page was last edited on 9 April 2017, at 17:44.